Gold tree . Brentwood Essex. Dolphin- Frinton on sea Essex. 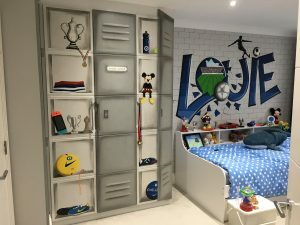 I specialise in murals for children – children’s bedrooms, playrooms and nurseries. Even in today’s world of TV and computer games we see how easily young children are drawn into the magical world of picture books. Imagine then the effects of your child’s bedroom or playroom being a giant picture book of colour and magical imagery. A children’s mural can stimulate your child’s imagination and transport your child to a land of fantasy and creativity. A colourful and vivid child’s mural provides limitless opportunities to support child development through play, story-telling and social experience with peers. 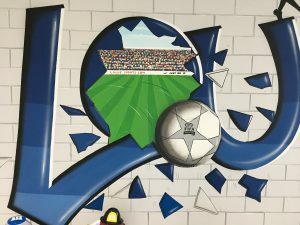 Even a small children’s mural can captivate a child’s imagination and when grown up, your child will live with rich memories of a magical childhood world. Call me on 07979 763859 or email angel@muralman.co.uk to discuss your needs. 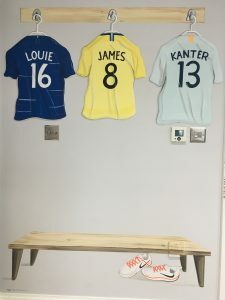 Here’s a boys football themed mural painted in Elstree Hertfordshire incorporating a locker with all his favourite sports items ..check out the hanging football shirts with name and date of birth! 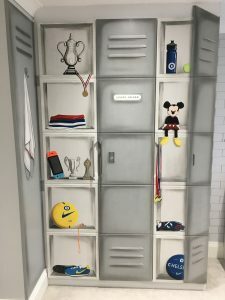 …A special room for any sports mad boys or girls !. The Whittington Hospital London. Tewkesbury Community Hospital Gloucestershire. Dress Circle London. Crocodile Cafe Muswell Hill London. The Kingfisher Nursing Home Emmanuel Lodge Cheshunt Hertfordshire. Queen Elizabeth School Barnet. Aldenham School Bushey. Little Angels School House london. Woodlands Day Nursery Barnet. Kindervine Nursery Park Royal London. Bookies Babes Stanmore London. Candy and Candy London Worlds Leading Interior Design.